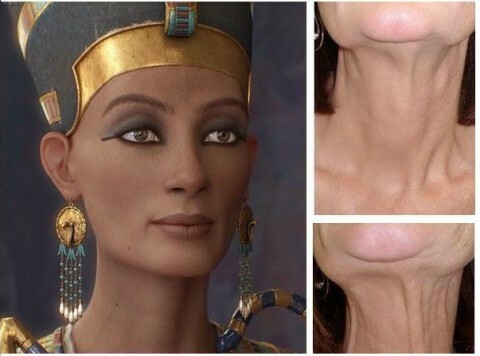 The Nefertiti Lift is a newer technique that uses Botox Cosmetic to contour the jaw line. It is named after Queen Nefertiti, who was historically known for the perfect shaped and contoured jaw line and neck. Lasting Looks Anti Aging and Laser Clinic in Toronto uses the Nefertiti Lift on our patients who want the effect of a mini lift of the jaw line. This technique will give you a noticeable difference in the amount of droopy skin at the jaw line by re contouring and creating visible lifting of the skin. Your jaw line will be less saggy and have a much more defined look. The Platysmal bands are the prominent vertical corded muscles that run under the jaw and down the sides of the neck. You can usually see these when you pull the sides of your mouth down hard and clench your jaw tensing your neck. By treating these muscles with Botox Cosmetic you will see definition in the jaw line and a less corded look in the neck..
As with all Botox treatments the results last an average of 3-4 months.